2018 Tournament Dates Still Available! 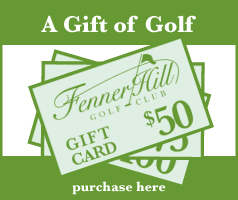 Your group or organization still has time to book their 2018 tournament at Fenner Hill It’s as easy as contacting Denise Teklinsky, Operations Director, at 640-9322. She can arrange dates and times as well as offer banquet facilities to round out your perfect experience of golf and food. Shopping for your husband can be quite a task if you have been married for a while. We can make your job easier. Visit our Pro Shop and pick from a large variety of golf clothing and balls. If he is hard to please, purchase a gift card and let him choose what he wants. Either way, we can take the stress out of shopping for the guy who has everything.